The musical partnership of David Crosby (born August 14, 1941), Stephen Stills (born January 3, 1945), and Graham Nash (born February 2, 1942), with and without Neil Young (born November 12, 1945), was not only one of the most successful touring and recording acts of the late ’60s, ’70s, and early ’80s — with the colorful, contrasting nature of the members’ characters and their connection to the political and cultural upheavals of the time — it was the only American-based band to approach the overall societal impact of the Beatles. The group was a second marriage for all the participants when it came together in 1968: Crosby had been a member of the Byrds, Nash was in the Hollies, and Stills had been part of Buffalo Springfield. The resulting trio, however, sounded like none of its predecessors and was characterized by a unique vocal blend and a musical approach that ranged from acoustic folk to melodic pop to hard rock. CSN’s debut album, released in 1969, was perfectly in tune with the times, and the group was an instant hit. By the time of their first tour (which included the Woodstock festival), they had added Young, also a veteran of Buffalo Springfield, who maintained a solo career. The first CSNY album, Déjà Vu, was a chart-topping hit in 1970, but the group split acrimoniously after a summer tour. 4 Way Street, a live double album issued after the breakup, was another number one hit. (When it was finally released on CD in 1992, it was lengthened with more live material.) In 1974, CSNY re-formed for a summer stadium tour without releasing a new record. Nevertheless, the compilation So Far became their third straight number one. 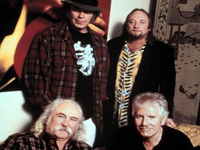 Crosby, Stills & Nash re-formed without Young in 1977 for the album CSN, another giant hit. They followed with Daylight Again in 1982, but by then Crosby was in the throes of drug addiction and increasing legal problems. He was in jail in 1985-1986, but cleaned up and returned to action, with the result that CSNY reunited for only their second studio album, American Dream, in 1988.